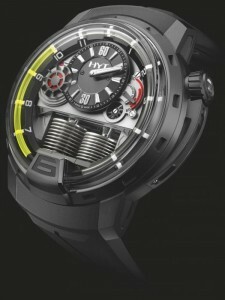 The vast majority of developments and innovations in the field of watchmaking focus first on improving the chronometric performance, then include several complications in one watch, and finally aesthetic modifications to carry a design of specific motion, and either reduce one dimension, as in the case of ultra-thin-or expand them in three watches watches volume. What almost always remains unchanged is the way to display the time using needles or with jumping discs from a mechanical point of view, based on the same set of wheels drawn from the barrel of minutes. However, fortunately for lovers of exclusive timepieces, there are other ways of showing the time that go beyond the use of handles incorporating unpublished technical solutions and even some that can be considered are the antithesis of the traditional mechanical watchmaking. Including that offered by the HYT which are mixed hydraulic and mechanical watchmaking. 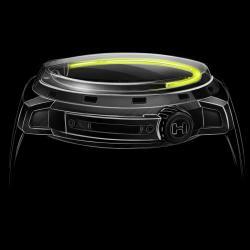 HYT is a watch brand founded by Patrick Berdoz, Emmanuel Savioz and Lucien Vouillamoz, which Vincent Perriard is its current CEO, his debut was the in merging, as mentioned, two fields that no one could imagine see together: the hydraulic and mechanical watchmaking. The idea of ​​Lucien Vuillamoz-training with an eclectic ranging from nuclear engineering and thermodynamics, to theology, to journalism or consultancy who car-obsessed in 2002 to design a wristwatch water. There is a new water use to measure time, just go back to the hourglasses dating from 1500 BC, based on the energy use of gravity for its operation. Here Lucien had to face two challenges: to replace this source of energy and it could be located in the confined space of a wristwatch. The composed of two distinct systems developed by two independent teams led by Bruno Moutarlier. The mechanical part, not surprisingly, is in charge of computing time and the minute display schedules. 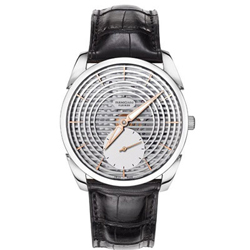 The hydraulic part complements the measurement of time visualizing with retrograde hours. In the upper region of found the mechanical device that gives life. Its development has been the responsibility of the firm Chronode the front of which is Jean-Francois Mojon. 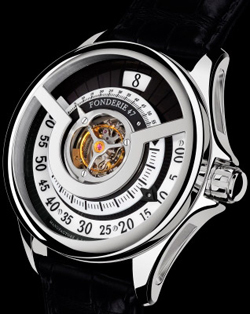 It is a manual winding movement with an oscillation frequency of 4 Hz, 28,800 vibrations per hour, with 35 jewels its unique barrel provides a generous 65 hours of power reserve. Through the transparent background you can see not only the robustness of the design but also the careful arrangement of each of the elements. Stresses the balance bridge, shaped arc punching two support points. The esqueleteado is also present in other bridges. 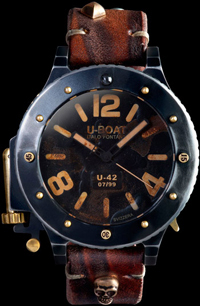 All visible parts are finely decorated with hand-crafted from a “Cotes de Geneve” and beveled edges. The front shows a marked symmetry has its focal point in the regulator located minutes to twelve hours. A wheel, as that could be used in an hourglass, located between nine and ten o’clock, is responsible for the seconds display, but rather it is a way of visualizing the clock is running. On the opposite side, between two and three, foreshadowed a sphere on which the reserve is indicated. Sebastien Perret has been commissioned to make this aggressive aesthetic design providing a three-dimensional architecture encapsulated in a box of generous size: a diameter of 48.8 mm and a thickness of 17.9, despite which surprises by adaptation to wrist and lightness thanks to the use of titanium in its construction. Undoubtedly the most attractive part lies in the retrograde hours display by a hydraulic capillary. The development of this system has been on Preciflex, HYT sister company, under the supervision of Lucien Vouillamoz own. The hydraulic system located in the lower part and visible through the glass, consists of two bellows. Both are filled with fluids: the character to the left is fluorescent, while on the right is transparent. When the clock strikes six hours left bellows is fully expanded, while the right is fully compressed. The running clock operates on a set of cams located at the top of each bellows. These two separate cams push pistons are ultimately responsible to act on the bellows. As time passes the fluorescent bellows containing compressed liquid will displace the resulting liquid containing and is displayed by the capillary. Turn the bellows on the right will expand to accommodate the liquid. There have been a few solutions that have had to be implemented to ensure proper operation of the system and the link between the two worlds, the hydraulic and mechanical response to the needs of use. On the one hand is to find a homogeneous liquid in texture and color, or transparency, can withstand temperature fluctuations without altering its properties, resistant to shock and vibration. These needs have given way to development of several innovations. So far there have been seven patents for technology and another for design. 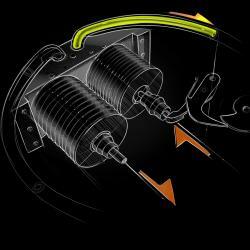 The bellows are constructed of a special alloy inspired sensors used in the aerospace industry. Its special design makes flexible and resilient, and its particular shape allows the reduction of the energy required to move and absorb shock enables it to receive the clock. The system time setting has required a special design to avoid excessive speed liquid to move through the capillary. The provides a new way to display the time with a special sensitivity to seek innovations beyond the traditional mechanical watchmaking. 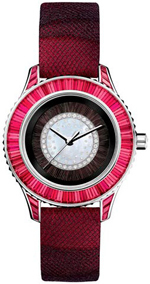 The unique color in the new women’s watch ArtyA 1/1 Set! New creature skilled watchmaker and a talented designer Ivan Arpa, to surprise the audience demanding the hour for their unique creations was another unique and beautiful creation for the beautiful half of humanity – women’s watch ArtyA 1/1 Set. 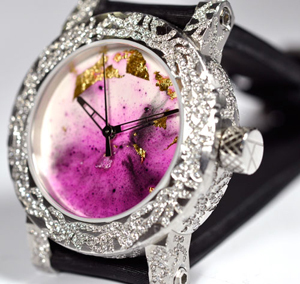 This model is a strange and wonderful combination of diamonds and purple dial. 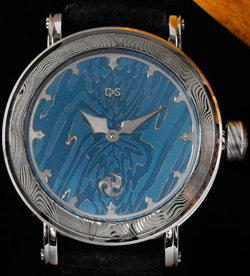 38 mm stainless steel watch case artfully decorated by hand 725 diamonds of various sizes totaling 3 carats, with the help of which was born a beautiful creation. December 8, 2011 WAS the last auction of Antiquorum, Whose Sales totaled $ 03.05 million. The Collection consists of Modern and vintage Watches, Has captured the Attention of More Than 357 registered bidders Online. The Bidding Took an active buyers from Japan Part, Russia, China, UK, Switzerland and Hong Kong. Thomas Preseren known as one of the most interesting independent artists, the author of two-and three-axis tourbillon, complex automated structures. Especially for Russia, he created a very interesting model in which there are no arrows. But there is a double-headed eagle, descended from the Russian coat of arms.